Hello lovely peeps! Today, I thought I would travel a little out of my comfort zone and go rustic! I have a love/hate relationship with kraft and rustic items . . . I LOVE them and the results other people get with them . . . they HATE me! 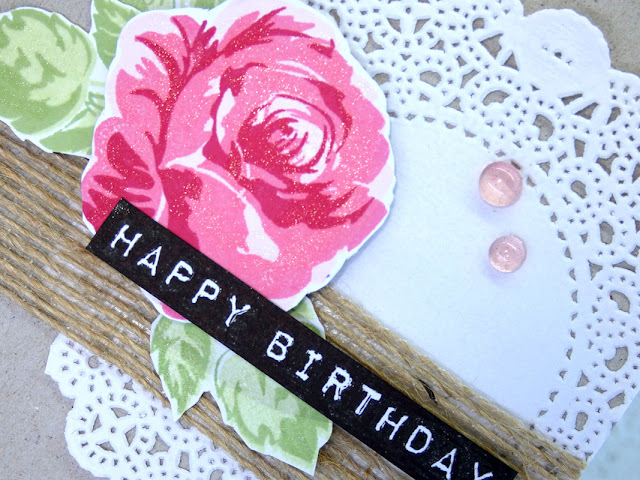 When I use kraft/rustic embellishment, it always looks like I rummaged through my waste bin and grabbed a handful of waste and threw it on a card base (I don't of course, but that is what it looks like). This time, I was pleasantly surprised . . . it didn't look half bad (for me). I made it with the Freshly Made Sketches challenge in mind, which, this week is a sketch by Amy. This is the sketch. Great, isn't it? This is my take. Explanations below the pics. First, I took a piece of card (from the back of an envelope, no point buying, when you can recycle, right?) 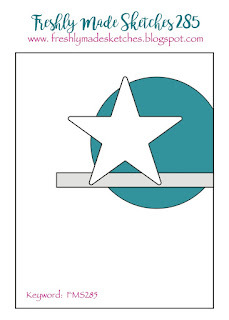 and adhered it to the front of a card base. Next, I took a small doily and adhered that down to the front of the card. Then, I cut a strip of jute 'ribbon' and adhered that. Next, I took my flowers and leaves and arranged them where I wanted them and adhered the leaves directly and the rose, up on foam for dimension. I finished, by adding the stamped sentiment with glue to the flower and foam to the jute (to keep it level). Finally, a lick of Stella over the rose and three of my home made dew drops (haven't used them in a while). That's it done! I'm off crafting with the girls tonight, so have a good evening/day, wherever you are and whatever you are doing! Your card is gorgeous Hazel, you are too hard on yourself. I love it. 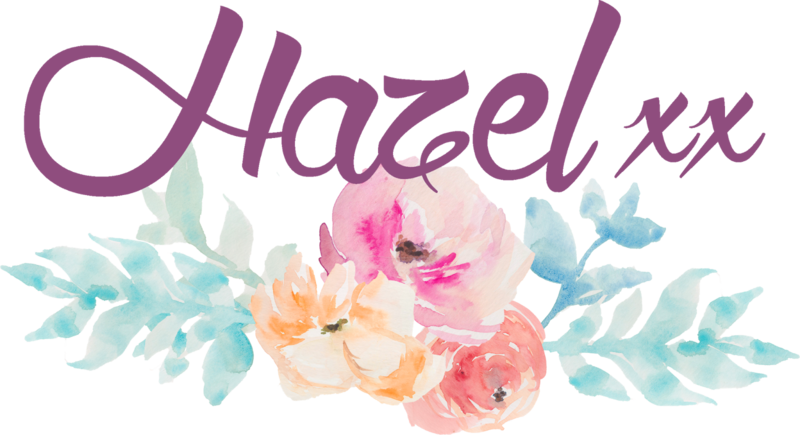 Your adventures with 'rustic' sound so funny, Hazel... now I have visions of you doing exactly what you said you didn't do!!! so pretty Hazel - i need to dig those doilies out and use them again! This definitely doesn't look like it came out of the trash, Hazel! It is delightful! The doily is so pretty on the kraft and I love the added texture of the ribbon and the pretty flower! Great job, my friend! 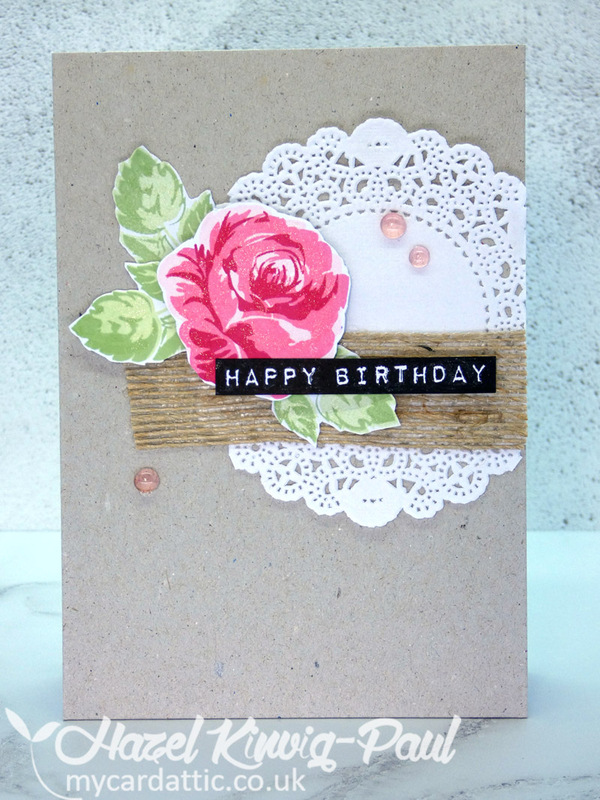 Sweet card...love the feminine look you created with that beautiful rose and sweet doily! Well, I think you do rustic quite well! I love the juxtaposition you've created with the elegant doily and the jute ribbon. Both make a lovely backdrop for the beautiful rose! 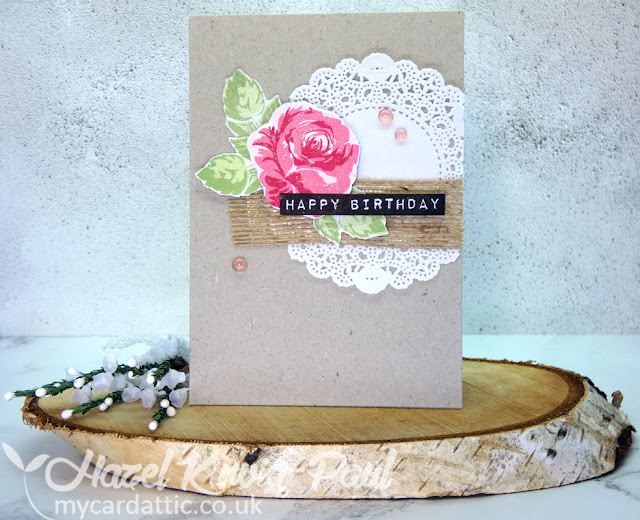 Well it has certainly worked with this card Hazel....Doesn't look at all you've used things from the bin and thrown it on...LOL xxxx (Your blog post made me chuckle x). 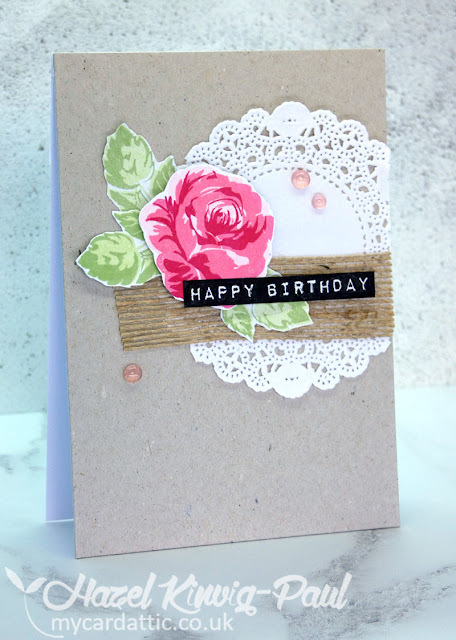 A gorgeous card, great elements and the perfect sketch to work from. 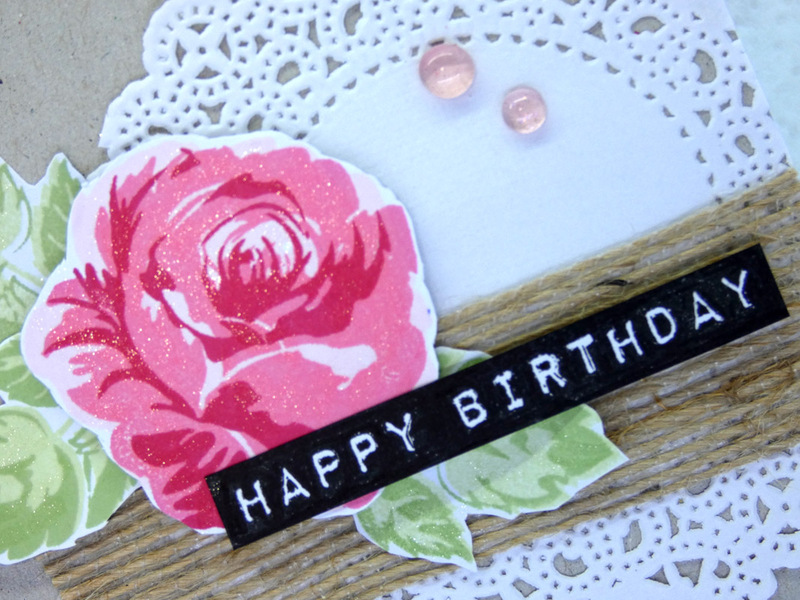 Thank you Hazel for sharing this beauty x Hope you had a great evening crafting with friends? Hazel, this is a beauty! Lovely! And, dramatic! Love your layout for this sketch. Beautiful card! Great use of the sketch. You have a super nice version of kraft paper. It is so light and lovely little speckles! Hazel, no one would know of your love/hate relationship looking at this card. It is lovely and feminine and sweet. 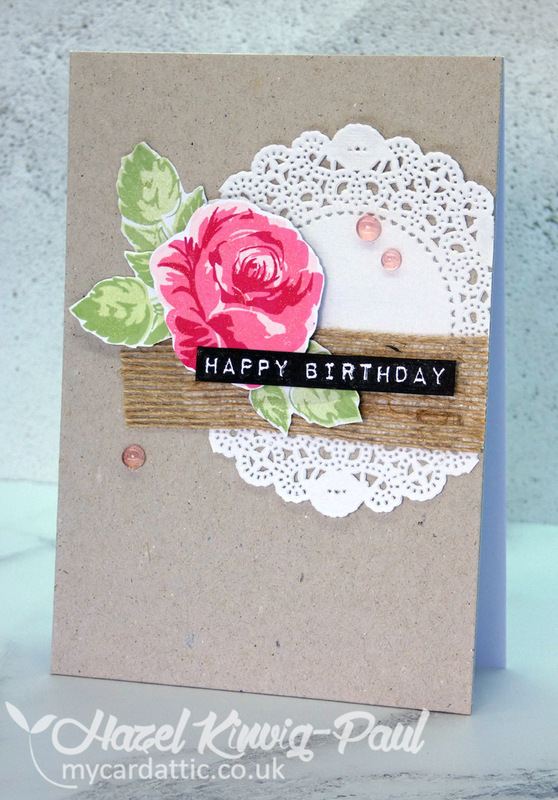 Super layered/vintage type card. Aww, you've done a wonderful job with this card, Hazel. It's lovely. I especially like the addition of that jute ribbon. It's such a nice contrast to the dainty doily. That's right, it doesn't look half bad - I would even say it looks AMAZING and I absolutely adore it! All the elements work perfectly together! Nothing about this card looks like it came from the wastepaper bin :) Gorgeous mix of elements, embellishments and patterns! Thanks so much for joining us at Freshly Made Sketches.